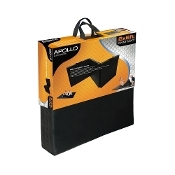 The Apollo Athletics Premium Exercise Mat is perfect for your daily exercise regime, making it more pleasurable to do your sit-ups, crunches and other floor routines. The hook and loop fasteners on the sides allow the attachment of multiple mats together to create a larger padded surface area. The mat is filled with a high density foam that provides superior cushioning for overall comfort. The mat folds for easy storage, and the high quality vinyl covering is easy to clean with soap and water.